When thinking of postcards, we immediately think of tourist shops in foreign cities. Or we think of the joy of receiving one, on the few occasions that a friend is patient enough to mail one from a work trip or holiday. There are also times when those lost in the mail resurface 8 months after they were first posted out and 5 months after they were given up for lost forever, adding a greater thrill to the basic joy of predictably delivered mail. But now, relegated as basic tourist-shop souvenirs, most postcards don’t demand a double-take. With pictorial representations of landmarks, and the city or country name printed in bold and sometimes obstructive letters, postcards in stores, unless you go searching for speciality stores, are at most times uninspiring, if not just unoriginal. For greater and more deliberately recorded details of the place of one’s travels, most people now turn to Instagram stories and posts. But travelling back in time to understand how postcard-art captured small details of colonial culture in India are Dr. Stephen Hughes and Emily Stevenson from the School of Oriental and African Studies. Their recently concluded exhibition, titled From Madras to Bangalore: Picture Postcards as Urban History of Colonial India, showcases postcards from Chennai and Bengaluru spanning over three decades from the year 1900. “Commercial Street, Bangalore”. Published by Wiele’s Studio, Bangalore. Early 20th century. “Just Like Master”. Published by Higginbotham & Co., Madras & Bangalore. Early 20th century. “Sub-Divisional Police Station, Bangalore”. Published by Spencer & Co., Madras. Posted on 12.03.1908. “The Coolest Place in the House”. Published by Higginbotham & Co., Madras & Bangalore. Early 20th century. TLJ: Through your research while curating postcards for the exhibition, what did you learn about art that is otherwise overlooked as ‘innocuous’, ‘common’, ‘everyday’ – like the art on postcards – and the messages it carries? S&E: As the most widely circulated and popular media of urban experience, postcards played a more important role in making, reinforcing and sustaining urban iconography. This role has not really been acknowledged and has remained surprisingly consistent over the last century. 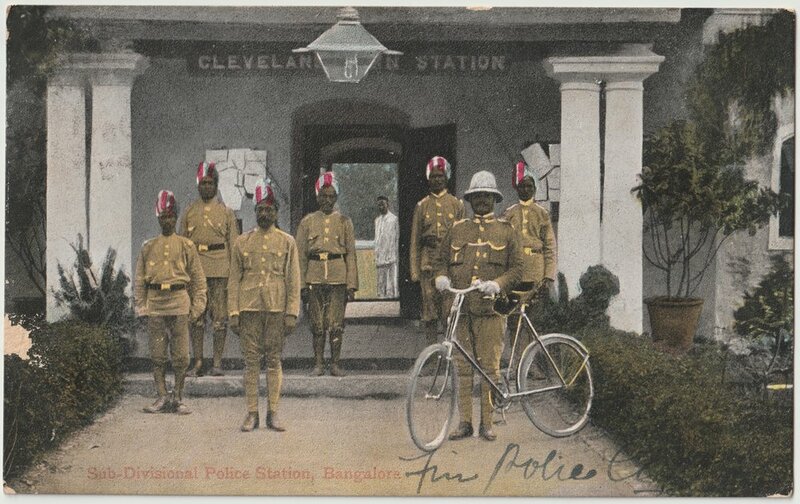 One of the main things that we wanted the exhibit to do was force people to rethink how they thought about British India in the early 20th century, and to do so by thinking critically about how postcards tried to capture urban life in south India. Contemporary postcards still echo the conventions of the early 20th century. They share a surprisingly consistent pictorial vocabulary of monuments, vistas, “sights” that are still part of contemporary imaginations of Chennai and Bengaluru. TLJ: Did you find that there was more diversity of art in these vintage postcards in your collections—in terms of form, subject, and artists or photographers’ contributions—than in postcards currently available in markets and tourist stores? S&E: Research by Dr. Julia Gillen has found that in the UK alone, 6 billion postcards were sent in the first decade of the 1900s. 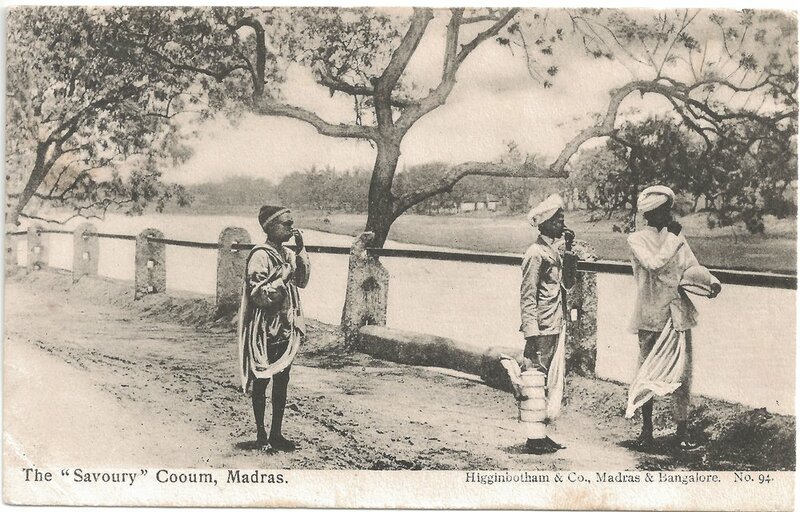 This is staggering amount that reveals just how popular the medium of postcards was in the early 20th century and certainly we found that a huge variety of picture postcards of Madras and Bangalore were produced at this time. The popularity of the medium made it an attractive commercial venture for large companies as well as smaller, independent photographic studios. We found evidence that there were nearly 40 postcard producers in existence in relatively small geographic areas in Madras and Bangalore who would have been in competition with one another. As an innovative, affordable, fast means of communication that combined image and text, it is no surprise that early 20th century picture postcards were hugely diverse in the subject matters they covered. Of course, today the production and consumption of postcards is nowhere near its past level and it is not uncommon to hear contemporary postcard users lament the lack of choice, in large part due to the rise of digital cameras, camera phones and social media. TLJ: Can you both recount one or two specific postcards as they spoke to you and how they threw light on some bits of the colonial? Stephen: My own collecting has inevitably spread out to cover all over south India and is much wider than what fit into our focus on Madras and Bangalore. 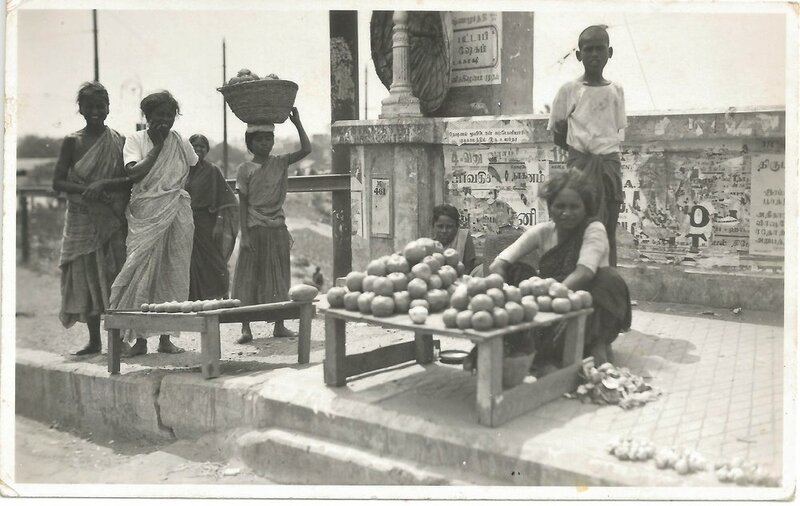 Uncaptioned real photo postcard of street vendors in Madras. Publisher unknown. Mid 1930s. My favourite images tend to be the more candid shots that catch people off guard or perhaps, stop them in their tracks as they try to figure out what the photographer was doing. These images, such as the one of street vendors in Madras, often catch people looking into the camera in ways that were not controlled entirely by the photographer so much as chance or the luck of circumstance. They can reveal a photographic encounter where the photographer and subject are interacting, momentarily and fleetingly sizing themselves up. Of course, the photographer takes over the image and reproduction from there, but at least we get a record of that brief moment of indeterminacy. Emily: I am likewise drawn to the more candid picture postcards that can give us insights into the urban experience in Madras and Bangalore in the early 20th century. One particular postcard that I find interesting, for several reasons, is a generically captioned street scene from Bangalore. “Street in the City”. Published by Wiele’s Studio, Bangalore. Posted on: 31.01.1907. For me, the use of hand-colouring is particularly effective in this image, however I also find the fact that it was produced by Wiele’s Studio significant since during my research I was able to unravel the story around this German-run studio which highlighted the connections between Madras and Bangalore as well as the complex, local networks between photographers within Bangalore at the time. On top of this, the postcard is part of a large collection that has remained intact over the past century and is therefore part of an on-going narrative of communication between friends in the early 1900s. Postcards can tell us so much more than we might initially assume when we look closely at their messages, marks of travel and production histories. TLJ: What were your considerations as you curated from the collection for the purposes of the exhibit? S&E: We looked at over 1000 postcards and managed to include just under 400 into the exhibition. We focused on the cards that seemed to best express some main themes that we’d identified, like public buildings and urban landmarks, street scenes, religion, leisure, and people. We deliberately tried to cover a full range of images from the most mundane and static to the most unique and provocative. We were not looking for the most artistic cards but were more keen to focus on the stories they told about the representation of the places, people, streets and built-spaces. TLJ: Tell us about what you learned through the hosting of the display. Now that the exhibition is nearing its closing date, how has audience reaction, comment, or process of viewing informed your research. Can you share an instance when your interaction with visitors educated or changed your perceptions of some of the postcards? S&E: From the beginning of the curatorial process, it was important to us that we find a way of getting feedback from visitors to the exhibition. As we thought about this, it occurred to us that it would be possible to combine our visitors’ responses with the act of writing a postcard – something that may be a familiar writing style and experience but is not something done by many of us on a regular basis in the 21st century. So, we decided to include a feedback area in the gallery where visitors could write their thoughts, questions and feedback onto reproductions of picture postcards from the exhibition and drop them into a ‘postbox’. We have been amazed by how many feedback postcards we have received and we have yet to read all of them, however so far we have been pleased to find numerous responses stating that the exhibition has encouraged critical reflections on colonialism, the significance of picture postcards in the early 20th century and the relationship this ‘old’ medium has with present-day social media. “Band-Day at the Marina, Madras”. Published by Wiele & Klein, Madras. Early 20th century. Message reads: “My dear May, All the carriages and cars are drawn up so that the people in them can hear the band play. If you were here I should take you every Monday and Thursday. Please thank daddy for the very pretty card and all the good wishes. As Uncle Will is writing this week I will wait until next as I have a lot of sewing to do. Love to all from Auntie Annie." “Madras Bobbies”. Publisher unknown. Early 20th century. “The ‘Savoury’ Cooum, Madras”. Published by Higginbotham & Co., Madras & Bangalore. Posted on: 30.02.1909. Message reads: "I wish you all the best for X-mas time and New Year. I wish I were spending mine at home - but it will not be long before I get away from the heat and smells. It is quite hot today. Au revoir. F. D."
“Date Palms, Madras”. Publisher unknown. Posted on: 30.11.1904. Message reads: “With Hearty Christmas Greetings. With love to you all. Christmas. 04”. “Lalbaugh, Bangalore”. Published by The Picture House, Bangalore. Posted on: 19.08.1912. Message: as yet not fully deciphered. Follow Emily and Stephen as they showcase more postcards from their collections, follow their project’s Instagram account here.